Learnings from Super Storm Sandy | Virtual Corporation, INC.
Crisis management before the storm is key! As the storm traveled up the east coast and through the Jersey shore, lower Manhattan stocked up on food and supplies, battened down the hatches and prepared for the worst. At the height of Superstorm Sandy the home office was damaged and 1500 employees were displaced. When the storm cleared and the water finally subsided, all staff members were accounted for through an Emergency Notification System. 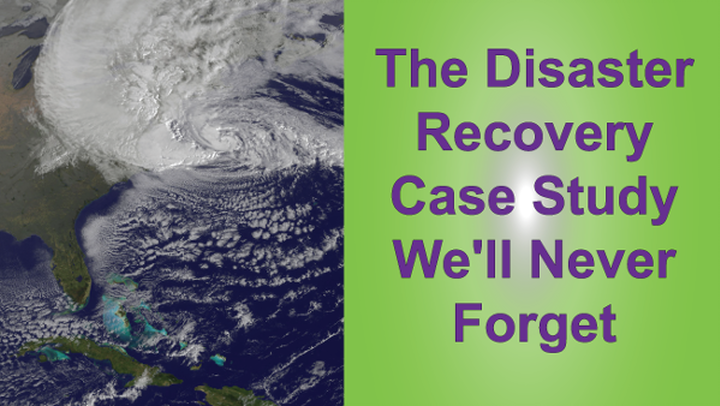 The disaster recovery process began. With the massive collateral damage to their building, local community and regionally the CM team was overwhelmed managing equipment requests, issuing all crisis communications, coordinating alternate work spaces along with lodging and transportation of staff members. Their current plans assumed 6 – 8 weeks for recovery, however the harsh reality from the hurricane’s damage meant that they would instead be displaced for an entire year. The team needed guidance to recovery and maintain operations. Virtual Corporation business continuity and disaster recovery consulting services stepped in. With an extended recovery process on the horizon, a crisis command center needed to be put in place. This newly created command center would serve as the centralized hub for receiving & processing request and ensure that key tasks & objectives would be managed in a unified and effective manner. Once the center was staffed and organized along with ICS best practices, the executive liaison and crisis commander could focus on the bigger picture and get back to their daily objectives. By using a formal crisis command center, the crisis team was able to eliminate the single-points of failure, reduced team members from “burning out,” effectively accounted for staff members, improved timelines of status reports, easily communicated priorities to/from executives, and easily managed lodging & staff transportation. Not having a pre-established Command Center can significantly delay or impair crisis communications, coordination, leadership, recovery, and physical security. If you have questions, or want to learn more about crisis management & disaster recovery tools or Virtual Corporation, feel free to contact us at info@virtual-corp.com.